David Schmit, vocals, guitar and accordian. Gary Waryan, Tablas, David Ballman, vocals, percussion, Tambura. Christine Larson, violin, vocals. David Schmit began his study of Bhakti yoga in 1974 in India, when his teacher, Maha Mandaleshwar Ma Yogashakti said to him "you practice Bhakti." Already a performing musician, he began leading chanting groups thereafter. He began his study of Sufi poetry in 1984. In 1994, he founded and directed Meeting Rivers Sacred Music Dance Theater which disbanded in 1999. The group recorded a CD, Meeting Rivers Live. Gary Waryan. For over 30 years, Gary has played the Tablas while studying both classical and folk styles. He playa with Dalyce Elliot, Jeff Waryan, Carnage, guitarist Greg Herrigas, The Bill Mike Band, the Wild Moon Bhaktas, and the musical innovators, Jellslave, whose new CD Purple Orange was released the spring of 2010. He prefers exploring the folk rhythms of India. Dalyce Elliot. Classically trained, Dalycee has performed kirtans for over fourteen years. 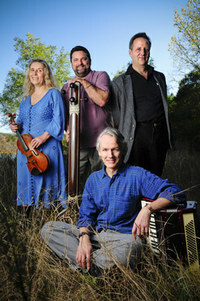 For the last five years, she has played Indian-inspired instrumental folk music with Gary and Jeff Waryan. Dalyce has composed many violin pieces and performs with American poets, folk and jazz musicians. Perfect Harmony, a CD of her violin compositions to her husband Timothy Young's recitations of Andalusian and Sufi love poetry will be released in 2011. David Ballman. David has been chanting Indian kirtans and Sufi chants for over 16 years. He also has sung with the Twin City Community Gospel Choir with Robert Robinson. David started the band Blue Garden which released the CD, Spirit Is A Luxury in 2006. He has performed at First Covenant Church, Joyce Methodist Churh, the Pantages Theater, Hell's Kitchen and the Holtby House in Minneapolis and Trinity Episcapal Church in New Orleans.